and discover information they need to make purchasing decisions. In 2018 our company reached over 50 million campers on Facebook for our RV Dealership Clients. That’s the result of bringing some of the best social media marketers in the RV Industry who are also RVers together to give our clients the best results in the industry. If it doesn’t make money, it doesn’t make sense. Our proven system is designed for one thing, to increase YOUR bottom line! they are able to get a sense of who they will be working with. out there to existing/potential customers. reminding your audience about your RV dealership 24/7. keep your followers up to date on your RV dealership. The goal of our Social Media marketing is to increase sales, period! We do this by creating authentic, socially engaging content relevant to Camping and RVing. Our content is created by RVers for RVers, which we will then publish on your social media networks. 20% of our posts will be advertisement posts where primarily we pull units from your site to drive traffic for that unit. All posts will be timely, relevant and compelling and all images will be created by us to attract readers and keep your audience hungry for more. that exist and how we are going to get results for your RV dealership. discuss additional accounts that need to be created. you will receive an analytics report outlining your stats for the month. There’s 3 main reasons so many dealerships choose to work with us. Our entire company is built with RVers, all but one are full timers. That means every piece of content, every caption, every interaction with your audience will be done with people who are able to connect because WE ARE your audience. It’s easy for us to create authentic content in our daily lives for our clients. That allows us to pump out more content than anyone else in the RV Industry! Because our team works remote from the open road, we don’t have the traditional marketing agency overhead costs. That means we can pass the savings onto our customers and give them high value with a low investment. Call us today to find out how we’re able to increase the sales for your dealership! If you’re new to Social Media and would like to understand it better, click here. If you have not read my RV Case Study, make sure you check it out as it covers how YOUR CUSTOMERS are shopping. To do an audit on yourself on your Facebook check out The 7 Most Common Mistakes dealerships make on their Facebook Page. If you are used to traditional advertising and curious about the difference between social and advertising click here. The 2 Biggest Challenges RV Dealerships have when approaching Social Media. The best FREE Facebook tactic! Would you like to know what the other RV Dealerships are running into with their marketing? The content you are posting onto Social Media for your RV Dealership must be authentic to add value to your audience. With the ability to control how we consume things online, it’s all about the user experience. As the markets get saturated, Social Media is going to continue to get more and more expensive. The internet has been joined by Web 2.0 (social media). Facebook Ads are the hottest and most effective marketing tool today for RV Dealerships. 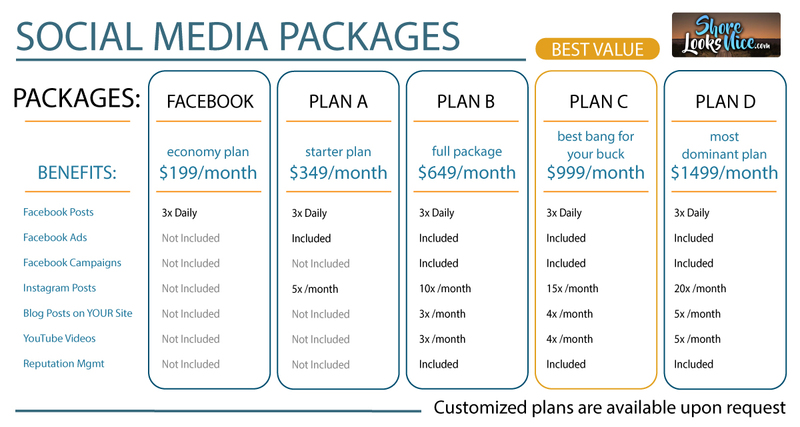 The difference in our RV Social Media Packages.